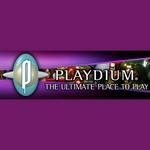 Playdium is an interactive family entertainment game centre located in Mississauga, Ontario. The family amusement centre features hundreds of indoor and outdoor games, rides, simulators, and more. Playdium Mississauga is owned by parent company Cineplex Entertainment. Products Carried: Playdium offers families and groups a 40,000 sq.ft.indoor and 11 acre outdoor interactive entertainment experience. Located in Mississauga Ontario, Playdium offers Video and Arcade Games, Batting Cages, Food & Drink, and Redemption Games. They also offer Go-Carts, Bumper Cars, 18-hole miniature golf course, and more. The Mississauga family centre boasts it is the ultimate place to play.